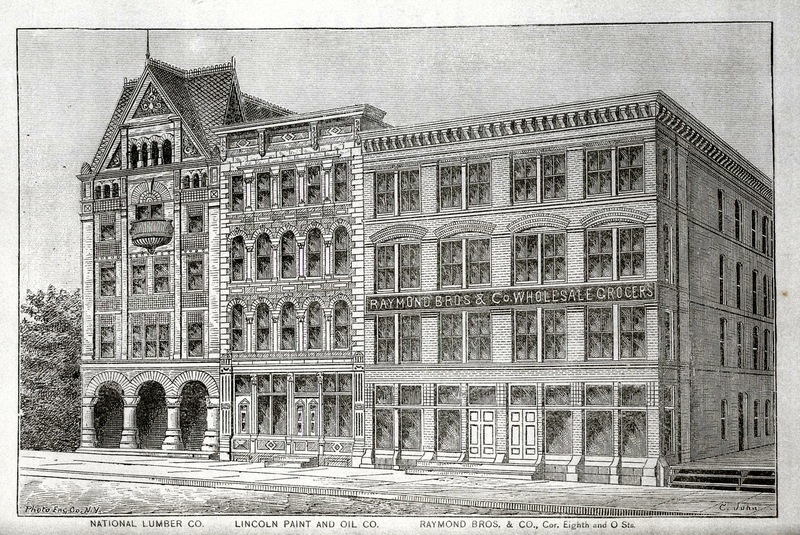 The Raymond Brothers were Lincoln's first wholesale grocers. When they arrived in 1872, they intended to start both retail and wholesale operations. While their small stock of groceries was still piled on the sidewalk, they disposed of $650 worth to local retailers, who had been in the habit of going to Omaha for their goods. The Raymonds soon confined themselves to their thriving jobbing business. 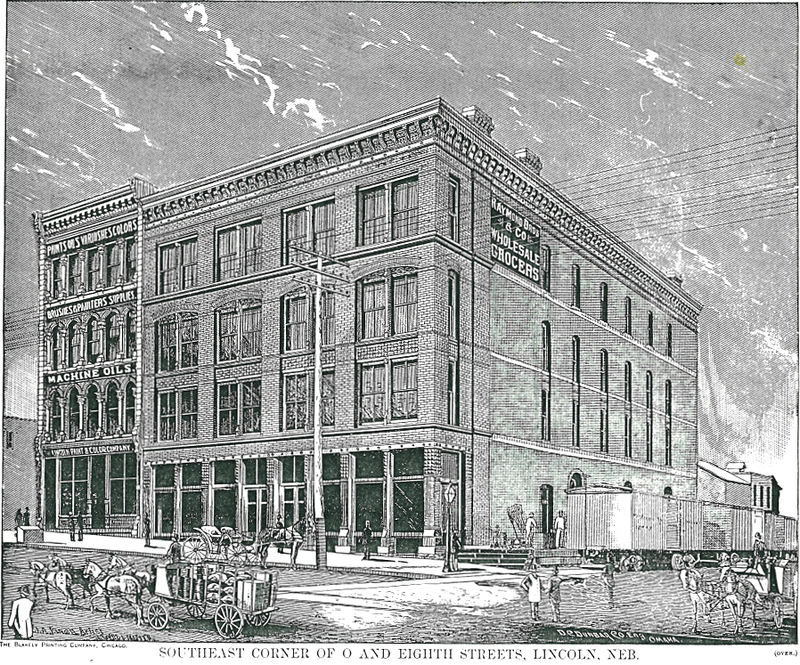 In 1885 Raymond Brothers moved into their new four-story building at 8th and O Streets. This warehouse is the grandest and the least altered of the district's surviving 19th century buildings. The north facade features not only another fine, Seaton & Lea cast iron storefront, but also terra cotta tiles between the second and third floor windows, wrought iron trim above the third floor windows, and multi-colored brickwork. The pressed metal cornice, the old painted wall sign high on the west wall, and herringbone-pattern freight doors in arched doorways on the west façade are among the other rare surviving features. 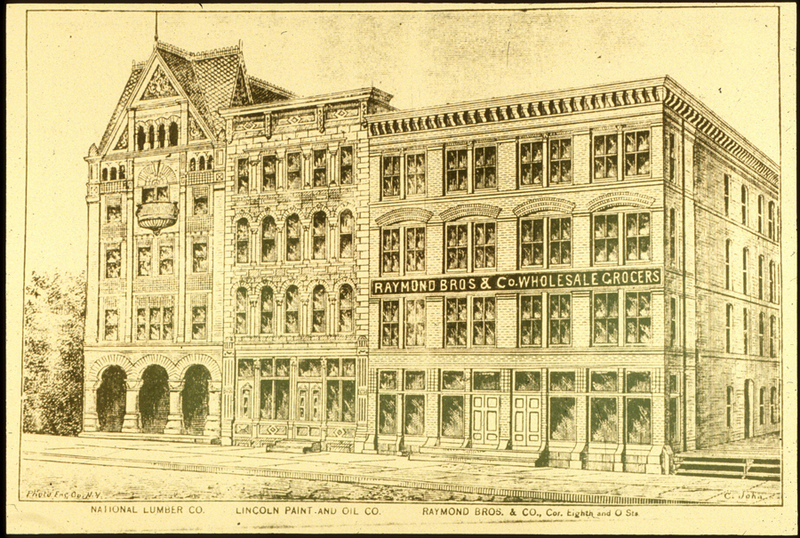 I. M. and A. S. Raymond and their partner G. H. Clark were especially active in expanding Lincoln's trade. I. M. was also a leader in early battles to put Lincoln on even footing with Missouri River towns in the railroads' rate structures, which remained an important issue into the 1890s. His involvement in the rate question led to his election to the State Senate in 1888.